We have already posted the discourses of Syed Zauqi Shah (RA) with Urdu translation. Here are some more extracts from Book: Vision for Seekers of The Truth. Most of the discourses were before the creation of Pakistan. 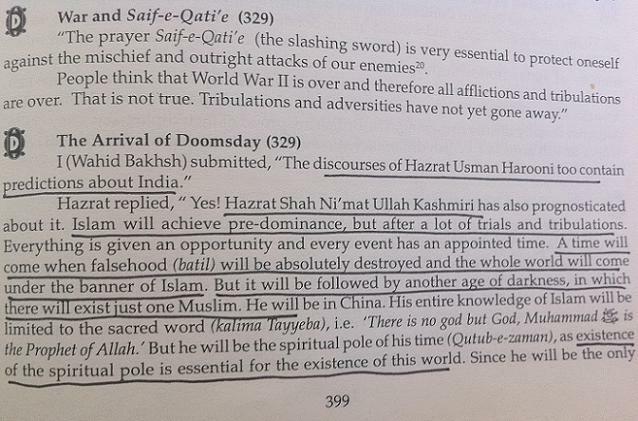 Interestingly, Syed Zauqi Shah (RA) mentioned the name of Hazrat Shah Naimatullah and his prediction about Conquest of India so it is another confirmation of Hazrat Naimat Ullah Shah Wali’s predictions. 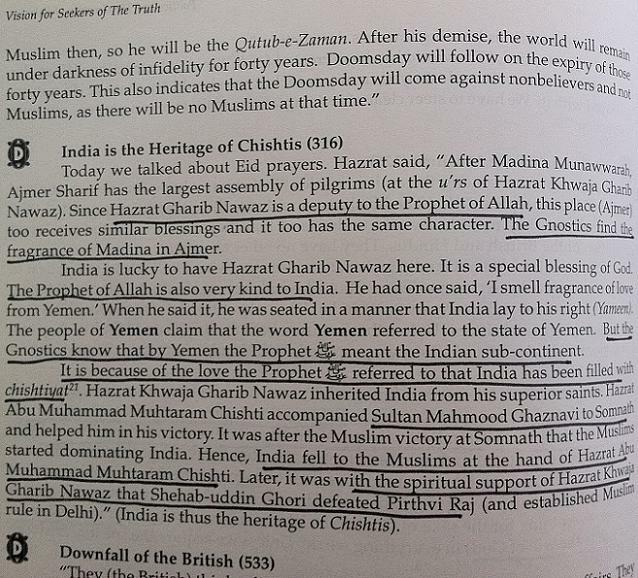 This glad tiding about India is also present in Hazrat Usman Harooni (RA)’s discourses. Next coming era will be the era of dominance of Islam. Allah gives knowledge to His pious people whatever He wills, and this knowledge is eye opening for those who regard this. He gives wisdom to whom He wills, and whoever is given wisdom is certainly given a lot of good. Only the people of understanding observe the advice. Urdu translation is added below. 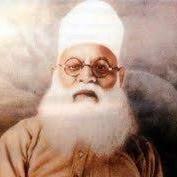 Hadhrat Maulana Rafiuddin رحمت الله عليه, the first administrator of Darul Uloom Deoband, possessed both internal and external knowledge. He was among the elders of the Naqshbandia clan. Towards the end of his life, he migrated to Makkah Mukarramah. He died there and is buried there. He was very keen to know about the appearance of the signs of the Day of Judgement especially the worldwide faithful struggle under the leadership of Hadhrat Mahdi. Hadhrat Mahdi was to appear in Makkah Mukarramah. On the other hand, Maulana Rafiuddin رحمت الله عليه knew the hadith that the Blessed Prophet Muhammad صلى الله عليه وسلم handed over the keys of the Ka’aba to the Shaibi clan on the occasion of the conquest of Makkah and since the Ka’aba would exist till the Day of Judgement, no matter if all the clans of Makkah are destroyed, the Shaibi clan would remain till then. Therefore, towards the end of his life, when Hadhrat Maulana Rafiuddin رحمت الله عليه strongly yearned to take the Bay’ah (oath of allegiance) of Hadhrat Mahdi and participate in Jihad (Holy war) under his leadership, he came up with an odd plan: Since this clan would continue to exist till the Day of Judgement, then evidently it would be present during the time of Imam Mahdi’s appearance. When Imam Mahdi will appear, he will be resting against the wall of the Ka’aba and taking the oath of allegiance from the Muslims. The keys of the Ka’aba would be in the hands of a member of the Shaibi clan. Therefore, in the context of this, Maulana took a harness, a sword and wrote a letter addressed to Hadhrat Mahdi. The text is as follows: “Dervish Rafiuddin from Deoband is hereby present in Makkah Mukarramah and you are preparing for jihad. You have mujahideen (warriors) accompanying you who will be given the same reward that was given to those who participated in the Battle of Badr. Thus, this harness is a token for you from Rafiuddin. Please hand over this sword to any mujahid (warrior) so that he may act as my representative by engaging in war and in this way, I can also earn the same reward.” Maulana entrusted these three items to the Shaibi clan and told them that since your clan will exist till the Day of Judgement, I hand over these items to you to give to Hadhrat Mahdi. When you die, pass on my will to your surrogate and tell him to inform his surrogate and so on till the time these items reach Hadhrat Mahdi. Khutbaat Hakeem ul Islam (book 2, pg. 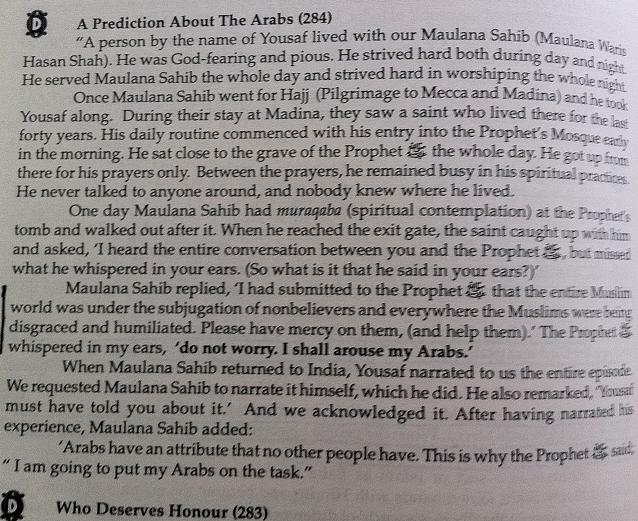 98)"
"Arabs have an attribute that no people have"... What is this attribute? May be I am wrong I think 'obedience' is their attribute. In a lecture Dr Israr Ahmed said Arabs followed every single command of Prophet Muhammad (saw) without going into any detail. They were not philosophical. They avoided deep thinking. It was very necessary at time of Prophet Muhammad (saw) to spread Islam and to give solid ground for Caliphate. If we go into deep on any matter they many disputes come out among people. When Islam spread to Iran and Rom (Turkey) in land of Aristotle and other philosophical thinkers then these people started thinking in deep as Quran also says about explore, research and deep thinking. So we find Sufi in these lands more than Arabs.... When Imam Mahdi will come and when Arabs will see powerful Caliphate of Imam Mahdi then in short time Arabs will show their obedience to Imam Mahdi's Caliphate. I mean it is very easy to combine Arabs in Islamic Caliphate. They need only power. Do Quran forbid Friendship Alliance with All Jews and Christens by Sheikh Imran Hosein as he Tells From Quran that which Christen or Jew we can make Friendship or Alliance? In another video Sheikh Imran Nazar Hosein said I have "NEVER SPOKEN ANYTHING" about HARUN YAHYA. whatever you post from Adnan oktar it is not much impressive because he is much controversial.It is suggested honestly to you that please study other islamic scholars and Hadiths on the subject. The time you people spent to follow these non-certified so called people's lectures and narration in my view its ios best if you start reading QURAN on your own on daily basis is far more best than thier work. Just read a one VERSE a day from an authentic transaltion of the menaing of the QURAN and it will change your life forever. AS ALLAH said in QURAN we sent this Noble QUARAN as simple as we can, So pay attention to it. I know this is not an exact translation of that specific VERSE. So, please don't be lazy and start reading and implementing he ALLAH's teaching in you life. !!! WAKE UP YOU DWELLERS !!! !!! WAKE UP YOU DWELLERS !!! Anonymous, who stops you or any other from reading or understanding the Holy Quran. I ensure you that not even a single novice student of spiritual path, like me, can preach such thing. Nauzbillah. The Sufis, Saints and Aulia-e-Allah are the people who have the indepth knowledge and understanding of Holy Quran. These people have the soul linkage, means that they are not just fulfilling the obligations as obligations but with true belief (Kamil Yaqeen). And these people are much poise in implementation of the teachings of Holy Prophet (PBUH). The people who spent time on this blog are not wasting there time rather they are keen to understand the reality. May Allah SWT guide us to mend our ways and bless us with true faith. Aameen. Holding the Sun : Holding or grasping the sum and having fullcontrol over it means that the observer of the dream will acquire dominion (or Land) in proportion to the amount he grasps provided the sum is clearly visible and its rays are crystal clear. If the light and rays of the sun are seen shining on someone the interpretation is the same as above. Dear brothers I am agree with all of your views. "Kissi cheez ka Illam na hona kissi cheez kay na honay kee illat naheen hay"
Believers and non-believers have the difference of faith and knowledge. No problem that many people are no agree with our ideas and thoughts but no problem, every one will see the truth one day....The big problem for the unity of Muslim Ummah is the Wahhabi regime in Saudi Arabia because they came in power with the help of the enemies of Islam. Otherwise when the Government/Regime/Emperors of Saudi Arabia decided to unite all ummah, it will take no time to be one Muslim Nation....Insha Allah when Mehdi Alaihe Salam will appear....all the differences will be ended in Ummah......Insha Allah we will see the glory of ISLAM again......The bright morning will come soon.. I really appreciate everyone's reaction and feedback in regards to my yesterday's comment. I have noted few points down but try get a point from mine too. FYI, I have a spiritual Guide too. Can you tell your name? Faisal yar kis chakkar main par gia hai? Apni raah khoti na kar. Focus, just focus on the task at hand and pay no heed to distractions. You know well that it nothing but an attempt to distract. They dont even know what they want to say actually! One thing more, signs of time are getting clearer by the minute with new signs...if only we have eyes to see. Brother Noor March on ? kia mutlab march to guzer chuka taqreeban hakoomat kay faisaly apkay samnay hain awam lambi need so rahi hay gadhay ghoray baich ker media kay aksar log bahkanay may masroof hain kia ho ga ?? you know what mate, i really am tempted to reply you that may deflate an enormous ego, but i wont. Faisal knows very well what it means when i say 'march on' on as i have complete confidence in his intellect and faith. I was least talking about the 3rd month of Gregorian calender. If you were intend to write to me please please go a head and would love to see and would love evaluate your reply, to see how I can improve myself further. Also let me know what you know about the date!!! We must admit the intellect of Brother Faisal, he can find anything with reference of Adnan Oktar Sahib, I mean, He has in depth knowledge of Adnan Oktar's work. and he always provides links to his work. Keep it up Faisal !! Brothers, don't worry aboutt appearance of any fake Mehdi if you have doubts in your minds. This universe is administrated by Allah (SWT), so Allah will never let any fake one to take the credit. Jo haqdar ho ga ye izaz usay hi mile ga. Be fikr ho jaen iss maamle mein. Jis se kaam lena hai Allah ussay hi agay ane de ga. Kainat ka RAB har dil ke haal se waqif hai. Thanks for comments, Masha'Allah. I am weak to express myself so don't know how to thanks you both :)... I have bad habit to reply so replies all bad and good comments. These distractions tends me into deep research.... I am not intellect but as my only focus is Adnan Oktar and Dr. Israr so I can easily find their material. Team of Adnan Oktar is so professional that they made available all materials easy to access to ordinary people like me. Anyone can reach to his work easily. Why I post material of Adnan Oktar only? because I am following him since 1999, I have contacts with his official representations and few days ago he came in my dream with my father. My father gave me book/laptop and Adnan Oktar marked his glowing name "Harun Yahya" with a stamp on the screen/cover. In another dream I went to a Pakistani tailor with his Turkish student to stitch a suite for him but tailor refused and when I demanded my money back then tailor said rats have eaten your money. Then I guided his student to another tailor. I profoundly apologise if my comments hurt anyone. I can see it did that is the reason I apologised from my beloved Brothers. I had or have no intention to distract or hurt anyone, in fact to I wanted to push everyone in a state of mind where you can evaluate the things with your intellect and light. The intellect and the light that is given to us by Allah, so we can seek help from him to continue our normal life without the impact of any despair and current ailments of our people. FYI, I am just a normal Muslim but for your ease I am from Sunni (Braelvi) school. My first Spiritual Guide is from Qadria Silsla. When right time will come I will let you know with my name too. Would you mind if I share something with you highly respectable people? I am sure you will not mind, it is about the awaited one and FYI, at the moment he is in England and haven’t you noticed what is been happening since the start of 2011. Another clue pay a heavy attention on what ever happened in Japan in March last year and this year. It will give you more clues to track down the truth. Also pay attention and find out why more and more solar storms are heading towards our earth and where exactly on our earth. I have mentioned earlier approximately all world leaders, clerics and generals know about him but their hypocrisy, guilt and arrogance holding them back. It’s enough for today, but if you really take care about what you talk about then start looking for truth now and then I will see enough efforts from you then we will see how we can go from there on wards. Salam to Pakistan and my Love and Prayers for all Muslims especially for Pakistanis. @ at the moment he is in England "
it seem like you are pointing toward Bilawal Bhuto zardari he is another stooge. "I have mentioned earlier approximately all world leaders, clerics and generals know about him but their hypocrisy, guilt and arrogance holding them back." brother it is also hypocrisy and guilt that you are not revealing his name there and creating useless suspence. For God Sake its not Bilawal he is an idiot. And its not hipocricy it is to give you a chance to use your own intellect and light to find out the truth (to start a brian storming process). Also I responded to you the way you do so be carefull my friend do not jump to conclusions be carefull before you think and say something about someone. You have absolutely no idea with whom you are inteacting at the moment..
sorry if my comments hurt you bro.can you give us some clue when you will reveal his name? @ Anonymous, i think you are not muslim since in your comments you are writing word " God " this word is not for our muslims they love to say " Allah " Rab Tala " , and 2nd thing when you say "Salam to Pakistan and my Love and Prayers for all Muslims especially for Pakistanis " its also shows that you are not among of us if you pray like this " May Allah bless all of us and our country "
and when you saying i am a normal muslim and Silsila Qadriay i think you even did not have any single frangnence of this blessed silsila in your wiritng , So be a muslim and make sure when you are writing you have to be very careful about the wrods coz words reflect the real personality. one more thing dont worry about Pakistan RAB DI DARTI RAB DA NIZAM so pakistan is also a part of his Nizam AND HE KNEW WHAT AND WHERE PAKISTAN HAS TO GO AND WHAT PAKISTAN HA TO DO, not need your comments and shown yourself as sahibay amar. Anyway NN, already declared me that I am not a Pakistani and above all not even a Muslim... I really feel pitty for him "NN"... "ALLAH protect all of us" ?????? Anyway NN, already declared me that I am not a Pakistani and above all not even a Muslim... I really feel pity for him "NN"... "ALLAH protect all of us" ?????? There are many Anonymous so you should pick any name. I said 'England Waley' as you said "...at the moment he is in England" in your comment..... I can't trace IP and don't want to trace anyone. i am not one of them who are declaring others non- muslims , what ever you are even i am not bothered, this blog is spreading love and affection towards pakistan and importance of this country, so we should become part of this or stay out. Yes agreed @Anonymous, He can't be from Bani Israel..As per Ahadiths he only can be from Sadaats. He wil be a man with lal topi. He will not be hidden. Everyone will know him and people will be suprised when he will get the president chair in Pakista. A great saint Kala Shah kaku (r) told to writer Mumtaz mufti that a man with lal topi red cap will take charge of Pakistan soon inshAllah. My fingers are pointing to Syed Zaid Hamid. He know himself very well. Wallaho alim.